Sometimes counting books are to be endured. Others like Richard Scarry are laughed and chuckled over. This one is lovely and nice. Birds of all sorts are included, some in their natural environment and others more fanciful. If you're reading counting books, this one makes the cut. I first saw this book a couple of years ago, but since at the time the library didn't have it, I forgot about it. Fast forward to last month when I was working on Christmas gift suggestions for family members which included Manhattan Toy Nursing Nina Cat for our youngest. I checked our library again and this time it was listed. It's a cute book and although my kids don't see me nursing babies anymore, the baby animals and their mamas are endearing. I hope Laura likes her 'Nursing Nina' cat and kittens as much as I do. 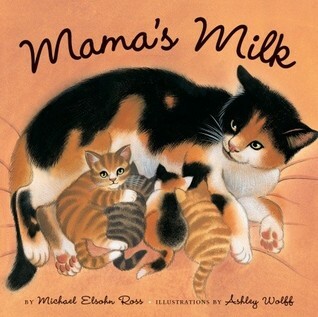 It reminds me of our two family cats, Taffy and Misty and their kittens we enjoyed. So I guess this book stirred up some brouhaha in the book world for its portrayal of cheerful slave-servants making a dessert in the kitchen. And judging from the edited, updated, and improvised Goodreads reviews, many readers didn't know they should be upset until some book related media outlets told them to be. Thus the hasty post-scripts and asterisks denoting further additions to their original book reviews. And then with a nod to political correctness, an inter-racial couple is celebrated on the last pages. But the focus on household inventions and lifestyle changes in four different centuries is interesting, although the dessert itself, the blackberry fool is unremarkable. The illustrations are nice, but not a book I would care to own. A young boy, whose father spends many days away fishing, finds a whale washed up on shore. He lugs the whale home, plops into his bathtub and waits for his father to return. He sneaks the whale food but finally needs to share this secret with his dad. Father and son together help return the whale back to the sea. It is a sweet story about the balance of work, family time and caring for God's creatures..
An interesting read, although a bit confusing at times to my youngest, probably best for slightly older children with a few more references to draw from. It is amusing and thought-provoking without dropping into preachy ideas about the environment or social classes. Home also showcases a good mixture of real homes and more imaginary ones. The illustrator, Jon Klassen has many other books published, but the one I remember him for is Lemony Snicket's The Dark which I really liked. The plot is told just as much in the illustrations as in the written words. And of course, the dog knows better than the humans. Laura really liked this one and so did I. Clever. I follow this author/illustrator on Tumblr and she is so talented. I love the world she has created with these adorable critters. This one takes you through the alphabet and the seasons simultaneously which is captivating. Perhaps a line of small soft toys from Teagan White would extend the playfulness of her books. Another book with these critters is due out next year. So I don't know enough of the agenda behind the creation of Rosie the Riveter from the WW2 era to have firm ideas about her and I'm not a generally a big fan of books whose message falls into the 'you can do anything' camp. But since I have a young crafter/designer who frequently raids the recycling bins for materials and projects, I know a little something about girls who think about making stuff. Boys too of course. Overall, a fun book which may prompt some serious junk crafting, so stock up on tape, glue and paint and see what happens. I can't remember if I suggested this book to our library or what, but it is a newly published book which follows the adventures of a young writer, Rufus who opts for a Story Stand outside his house which engages his friends' and family's attention. Meaningful bartering ensues. This book contains stories within the story and each one is fun and unique. My twelve year old laughed loud and long over the part pictured below where someone in a story finds a wallet with five million dollars inside. Cute and well done. A keeper. So I enjoyed the Twelve Kinds of Ice (see below) so much I researched what else she had written and found this one at the library. A great nature habitat book on the relationship between trees and the animal world who live amongst them. And then of course, the humans who love their Christmas trees. Very, very nice. A delightful book. Full stop, as they say. She writes with the ease of someone enchanted with their childhood, remembering all the best parts of her home life. Excellent line drawings by Barbara McClintock whose other books we have enjoyed too. And to those who complain that the girls are all figure-skaters and the boys are all hockey-players perhaps should consider that this is a completely normal historical depiction and memoirs do not need to major in exceptions so that everyone feels included. I grew up skating on a local pond and none of the neighborhood boys wanted to be figure-skaters. Anyways, a great book for long winters. Found this book at a secondhand shop and read it in one night, enjoying myself immensely. I have the sequel, Going Solo, from the library waiting its turn. Perhaps tonight. I knew very little about Roald Dahl so this was a great read for me both as informing and entertaining. Of course, I got to the classic lines read aloud on You've Got Mail and now could enjoy the context surrounding that anecdote. The first in a series of books about dogs of which I am not generally enamored with, but weave in a good human interest story and I'm there. Excellent coming-of-age type of book and great especially for boys. We have several more to read in this series so I have high hopes for further compelling stories. So I'm about to tread on sacred ground here and not be as generous as perhaps I should be. I thought this started off well, but descended into syrupy romantic notions too much for my real enjoyment. I made myself finish it, but most of the initial pleasure was long gone. Angel was too perfect for my liking, I think and as their romance progressed it just got a little ridiculous. I preferred the first parts of the book where he is enjoying his creatures and his work, and the beginning of the friendship with Angel, but it became too much for me as the story unfolded. I'm glad to have read it, but I did not pass it on to my twelve year old boy yet. I read Girl of Limberlost before this one and thought the wheels came off at the very end as well. My very first time reading this book and oh, I loved it. Finishing it made me eager to start it all over again. I loved the voice of the story teller, young Scout and the ending was perfectly delicious. I'm so glad I can join the ranks of readers who delight in this story. I haven't decided if I will read the newest release or just enjoy this one for a few years. I missed mentioning this one in my September book post, so I'm adding it here. 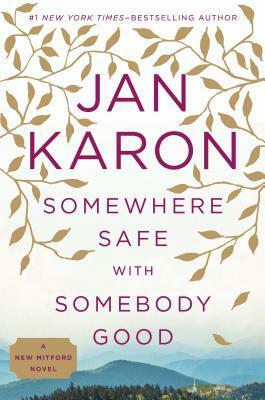 I really enjoyed every minute of this novel and felt like it was in the same spirit as her earlier books. I really cannot get enough of her stories and feel no shame in not having anything poor to say about this Mitford novel. These are books I will be reading when I'm eighty, if I make it there. And that's comforting. Next up, some Christmas books I think. Trying to stay current around here. Seriously dangerous for my book budget, those picture books look yummy. I've also only read To Kill a Mockingbird this year, and decided against reading Go Set a Watchman. I've read too mamny mixed reviews about it...I just want to enjoy the first for now. I'm with you, I'm waiting to read the second one too. Thanks for stopping by, Helena. Happy Advent! always love /appreciate your book list shares!